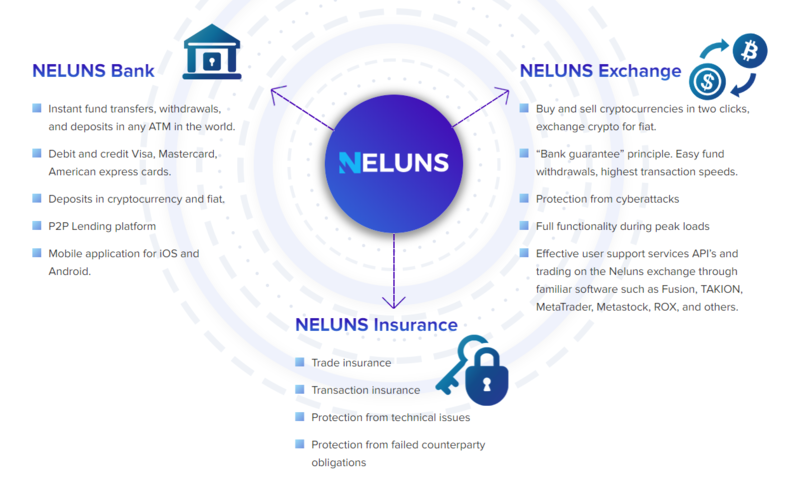 Neluns is the innovative financial ecosystem, combining within itself a bank that can work with fiat and cryptocurrencies, as well as a cryptocurrency exchange and insurance company, creating the best conditions for the quality development of the cryptocurrency market, inflow of new participants and capital. Is to create an innovative financial ecosystem, combining within itself a bank, which operates with fiat and cryptocurrencies, a cryptocurrency exchange and insurance company, thus, creating conditions for the quality development of the cryptocurrency market and inflow of new participants and new capital. • Limited amount of banking services. • Limited selection of financial instruments. • Difficulties with converting cryptocurrencies to fiat. • Challenges in working with cryptocurrency exchanges: o Exchanges crash during peak loads. o Issues with registering and passing verification. o Fund withdrawal limits. o Big losses due to hackers attacks. • A near full absence of cryptocurrencies being utilized as a means of payment. • Absence of insuring trades and transactions. 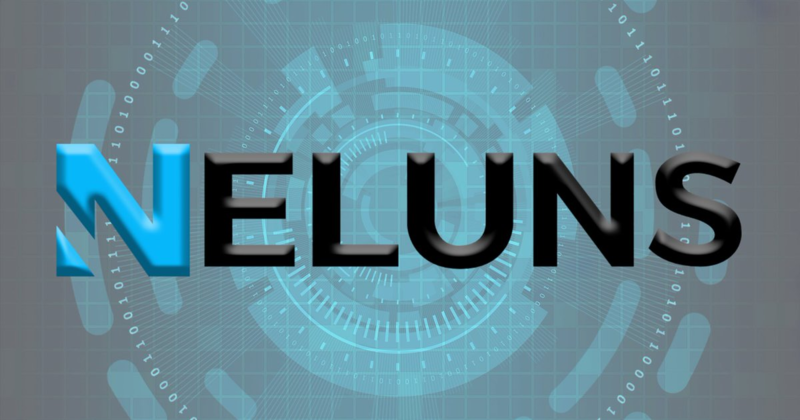 Neluns will achieve this goal through creating the most convenient conditions, to broaden the possibilities of current participants and open up access to the cryptocurrency sphere for a broad range of users. Neluns will become the cryptocurrency markets development catalyst. • purchase and sell cryptocurrencies in just a few clicks. • lead active cryptocurrency trading on the exchange. • deposit and withdraw funds from the system in just a few clicks from any part of the world. 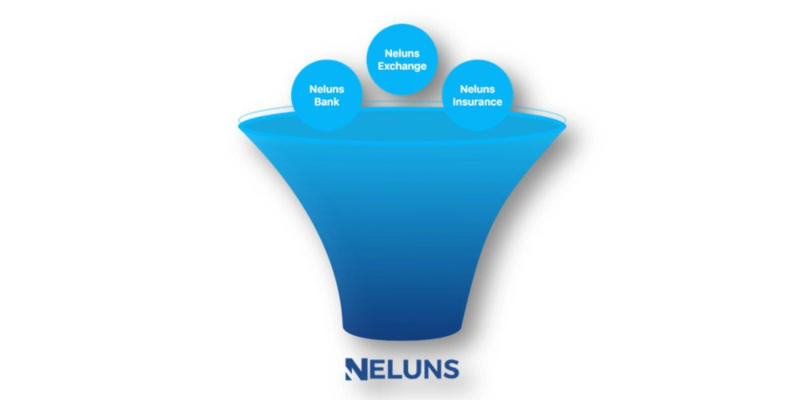 Neluns Bank comply with all financial regulations governing banking activities while providing users with all banking services in both fiat and cryptocurrency. Neluns Exchange is governed by the U.S. Securities and Exchange Commission license, an innovative exchange process which is fast and secure for cryptocurrency transactions. Neluns Insurance Company obtaining U.S. Commodity Futures Trading Commission license and ensures all trade and transactions carried out in the system are secured. 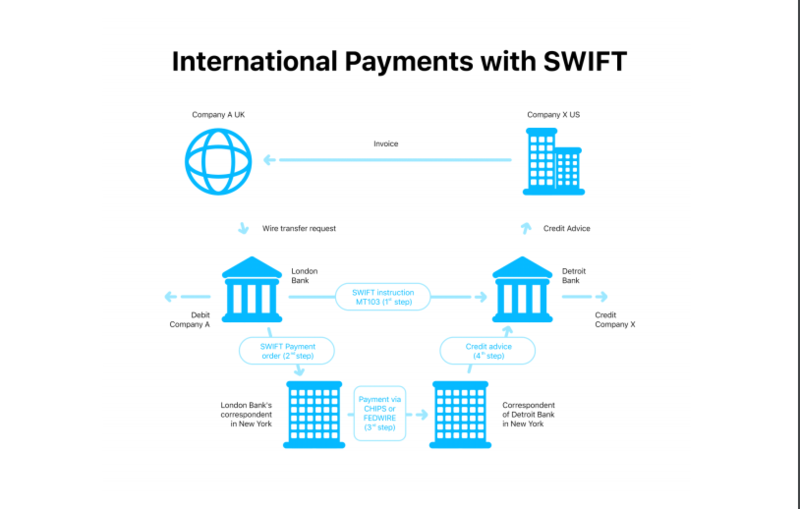 Mobile application for iOS and Android Applications for iOS and Android will make it easy to transfer, exchange operations, receiving and giving out loans in fiat and cryptocurrencies (p2p-crediting) just in two clicks. The iOS and Android applications will allow you to make all possible trade operations within the Neluns ecosystem: buy and sell cryptocurrencies on the Neluns Exchange in one click, make an interest receiving deposit in the Neluns Bank, receive a loan from the Neluns Bank, provide or receive a loan on the P2P-platform, make transactions anywhere in the world in a matter of seconds. Innovative technologies ensure a hassle-free and quick trading of cryptocurrencies despite the peak loads. Under the protection of the “Bank Guarantee” principle users can actively participate in trading of cryptocurrencies. “Bank Guarantee” principle in conjunction with leading technologies allows you to easy withdraw your funds. It also provides a high level of protection from cyber-attacks and creates perfect conditions for cryptocurrency traders and fiat funds. Users can make withdrawals from around the globe under the guard of the Federal Deposit Insurance Corporation (FDIC). Users get access to four types of debit or credit cards. These are: Lite, Silver, Gold, and Platinum. Users can access loans in fiat or cryptocurrency in the Neluns banking system. Gain profits while lending funds on a P2P (peer-2-peer) Lending platform. The lending platform will function at the base of Neluns Bank and authorized users will be able to use this service. Active users get higher protection and other additional benefits. Users can receive profits from trading NLS tokens and dividends from all insured trades. Users get a chance to open a private or corporate multicurrency IBAN account. Besides, making purchases, sending payments, trading cryptocurrencies and fund withdrawals are available from any ATM around the globe 24 hours 7 days a week. All users are able to carry out transactions in USD, EUR, GBR as well as cryptocurrencies. A bank card will automatically accompany the multicurrency IBAN account.